of which were about 150 ft high. (Unposted, scan sent by Maurice Guise). tall structures could be tested (see the article). The bridge in the picture has been blown up, but in earlier days it was very important to local people living near the top of Green hill. It enabled them to move heavy loads up to and from Rise End, which otherwise could not be taken up the road from Wirksworth. Known as the Monkey Hole, the bridge appears to have got its name following the boast of the owner of a monkey, that the animal could retrieve a coin from anywhere. A local man took up the challenge and threw the coin over the bridge for the monkey to retrieve. The Monkey Hole is deep and dark. It got its name from a story of days gone by of an Italian organ grinder who used to entertain men working in the quarry, for that is what the Monkey Hole once was. From its top the organ grinder dangled a rope on which his monkey would perform tricks. One day the rope broke and the monkey was killed. This ended the performances, but the name has stuck ever since. This remarkable quarry is in the limestone district near Wirksworth in Derbyshire, and it is as remarkable for its shape as for its name. From the pictures on these pages you can see that its sides are almost vertical, and that it can only be entered through a narrow cleft in the rocks. On entering it through the cleft it is found to have a floor about 100 ft long and 50 ft wide, and its sided tower up to a height of about 150 ft. The floor is now clear and level, but many thousand tons of debris have been removed from it, and it is actually, 10 ft lower than when the quarrymen abandoned it. The Monkey Hole was cleared in this way because an entirely new use has been found for it - the testing of tall structures such as masts and towers. These must be able to resist the pressure of the wind, which of course can vary from a gentle zephyr to a howling gale, and engineers building structures of this kind must have some system of testing the calculations they make when designing them. The only way to make such tests is to attach ropes horizontally to the structures at various heights, and to apply forces through the ropes to represent wind pressures. It is not easy to do this in the open, because there natural wind pressures and other factors complicate matters. The ideal is to find a completely protected place, where the engineers carrying out the tests have to reckon only with the forces they apply through their ropes. The need for a testing station for these tall structures was realised by Stewarts and Lloyds Ltd., the well-known makers of steel tubes and other products, and their first efforts were devoted to finding a suitable site within easy reach. 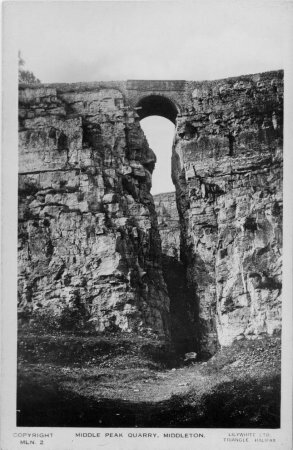 Members of the staff who were familiar with the limestone quarries worked by the company at Wirksworth soon recalled the one known as the Monkey Hole, and as soon s it was examined it was seen that it was ideal, for except to a limited extent through the narrow entrance, the wind cannot blow upon the structures to be tested. There is another reason why such a protected site was suitable for testing tall structures. 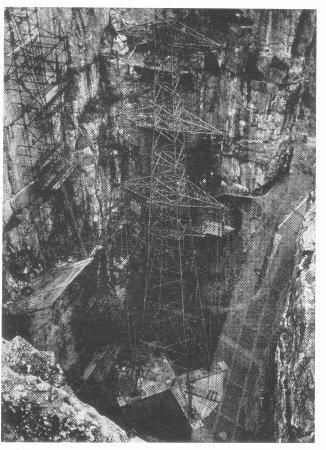 This is that there is no difficulty in finding points for anchoring pulleys in the rock face of the quarry so that ropes from the test points on the tower itself could be lead horizontally to them. Tests could be carried out on open ground only if two other towers of similar height were erected to provide the loading points. After clearing the site the first thing to be done was to lay down a universal type of concrete base to which towers of different varieties could be fixed. Loads up to 30 tons will be required for some tests, so the anchorage points at different levels had to be made very secure. In a test in which an increasing force was applied to the type of anchor selected, the eye of the anchor broke when a direct pull of 94 tons was exerted on it, but the anchor itself gave no sign of having been disturbed in its rock setting. This clearly left a good margin of safety. The loading at each point was obtained by a pull of 5 tons, which was multiplied by the usual arrangements of multi-sheave blocks, a required, up to the maximum 30 tons. Special winches had to be designed to apply the loads. These are equipped with gears designed to keep the speed of movement of the rope very low, the rate being about 1 ft 3 in. a minute, so that the loads are applied slowly in the tests. There are 12 winches, one for each of the ropes to the test tower passing over the pulleys to the loading points, which number 12. Each has a 2 h.p. motor, running at 960 r.p.m., but the main drum makes only half a revolution a minute because of the special gearing. The building in which the winches are installed is opposite the entrance to the quarry, and a general view of them is given in the lower illustration on this page. There are dials to indicate the loads applied at each of the 12 selected points. Others show how much the structure under test has moved at various points. This deflection measurement is carried out on wires attached to the structure that pass over pulleys and down into tubes standing on the quarry floor. Weights in the tubes keep the wires taut and a slot in the tube allows a rough indication of the movement to be measures against a scale at the side. The deflection is measured more accurately by electrical means, which are so sensitive that movement of a twentieth of an inch is detected. The main operator has a microphone through which he can give directions and an emergency "Stop Everything" button, which cuts off power to the winches. Two other operators control the winches by means of buttons, which must be held down all the time the winch is operating.